Orientation training is currently in draft and continues to undergo further development. Applicants may review the draft by clicking the link below, and should still check the box for "Yes, I watched the orientation" on the registration page. The program manager will alert participants when the orientation is updated. 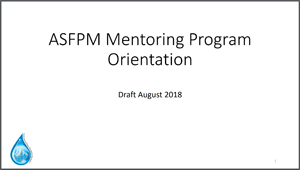 Please read the Mentoring Handbook for complete program details. The orientation presentation is currently in DRAFT format. Please direct any questions to the Program Manager. Create a mentee profile at Register as Mentee. Create a mentor profile at Become a Mentor.